When a desktop operating system goes end of life (like Windows XP did years ago and Windows 7 is doing soon), it’s a big deal. However, when a Windows server operating system goes end of life, it’s not only a big deal, but a big project, sometimes taking months to properly plan and execute. Servers are a central and integral piece to a business and migration projects require careful planning to minimize downtime and interruption to your business. 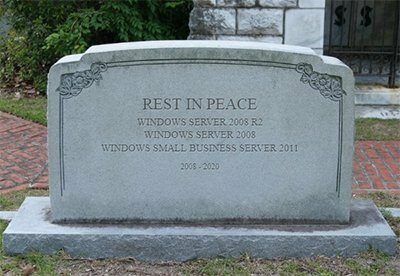 If you’re currently using Windows Server 2008, 2008 R2, or Small Business Server 2011, you’ll want to start planning as Windows Server 2008/R2 is no longer going to be supported as of January 2020. Let Weston help with your migration planning. When an operating system goes “End Of Life,” it means that no more security patches are going to be released for the operating system. As servers are typically opened up to the Internet from the outside world (so things like email, remote access and VPNs can work properly), it’s even more critical that you have current protection and patches in place to avoid your data being exposed to the wrong people and your network compromised. Weston has been around for 25 years and has been around the block a few times (our CEO still has his Windows for Workgroups certification hanging proudly on his wall). We’ve done countless server and email migrations, and know what it takes to make sure your office productivity does not grind to a halt. Hardware: If a server is running Windows 2008, it’s likely long out of warranty and should be replaced versus upgraded (in-place upgrades of server operating systems rarely work as smoothly as claimed). Modern operating systems require more resources and need modern hardware. We can help you size the hardware appropriately based on current and future plans for your environment. Email: If you’re using Windows Small Business Server 2011, your email is likely being hosted on your server using Microsoft Exchange, which is built-in. Windows Server 2016 and 2019 do not include Exchange built into it, and we recommend our clients migrate their email to Office 365. We are a cloud-certified Microsoft partner with Office 365-certified techs on staff. We’ve done loads of migrations from Exchange to Office 365, and the process is generally smooth and seamless from a user standpoint. Legacy Apps: If you’re running specialty line-of-business apps on your server, you’ll need to make sure those apps will work with a new server operating system. Talk to your software vendor for this, or we can help with the research and come up with a migration plan for those applications. Licensing: Current Windows server operating systems are licensed differently and have different versions depending on the size of your environment and the size of the hardware needed. Let us help you wade through the license requirements for your environment. Compliance: If you’re running in a regulated industry (HIPAA, SOX, etc…), you may be out of compliance with those regulations if your server is not up to date with security patches. Our entire staff has completed HIPAA training and can work with you to incorporate the security guidelines recommended by these compliance rules. Contact us today and let Weston help you with your next migration project.